It's the second of April and time to look back at an amazing first quarter full of fascinating vizzes. This quarter represents a significant milestone: the first time more than half of the vizzes in the Top 10 are from outside the US. In fact, 14 out of the top 20 originate from outside of North America, including the most trafficked viz, a controversial viz on gun control from Shane Luskie in Melbourne, Australia. Now that tells a story! We cannot ignore the most interactive viz from Sean Callinan, showing crime stats in Queensland. This racked up a scorching 82% interactivity rate, one of the highest ever for a widely distributed viz. 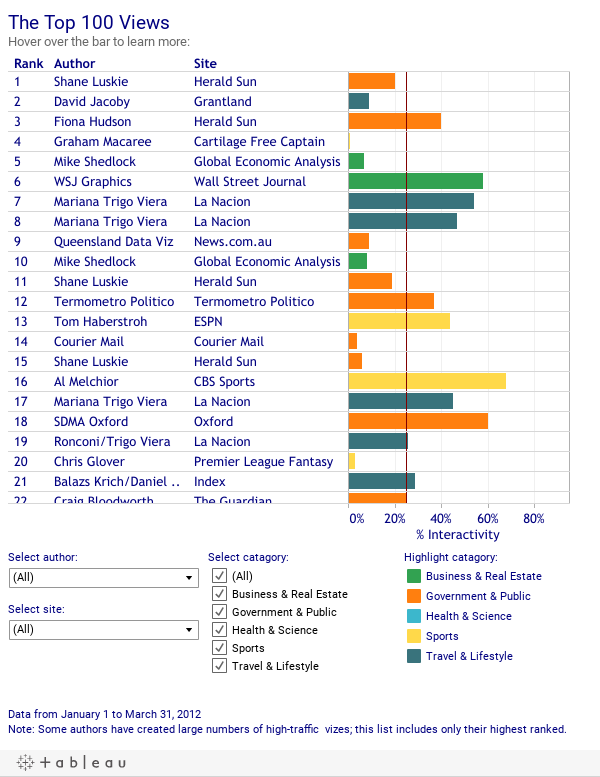 Other interesting vizzes include the Reality TV Fantasy Scorecard from Grantland and numerous vizzes from La Nacion in Argentina.